1Intel Corporation, Hillsboro, USA; 2School of Electrical Engineering and Computer Science, Oregon State University, Corvallis, USA. In this paper, we derive a new method for estimating the parameters of the K distribution when a limited number of samples are available. The method is based on an approximation of the Bessel function of the second kind that reduces the complexity of the estimation formulas in comparison to those used by the maximum likelihood algorithm. The proposed method has better performance in comparison with existing methods of the same complexity giving a lower mean squared error when the number of samples used for the estimation is relatively low. The estimation of the parameters of a distribution with a limited number of samples available is usually a challenging task. A reduced number of samples constrains the use of the method of moments (MoM) which despite having low complexity has relatively low performance due to its high dependency on the sample size. Prior in  presented a study of the minimum number of samples required for the estimation of the K distribution parameters estimators using moments. Estimators with smaller variance based also on moments are usually preferred, though the one based on the maximum likelihood (ML) method is generally the method of choice. Despite the fact that ML estimators are optimal, in some cases they require either the evaluation of uncommon functions or the solution of non-linear equations when no closed-form expressions of them exist. with . Furthermore, it has been shown that the distribution is generated by where Y is a zero mean Gaussian random variable with variance b2 and Z is gamma distributed with parameters . 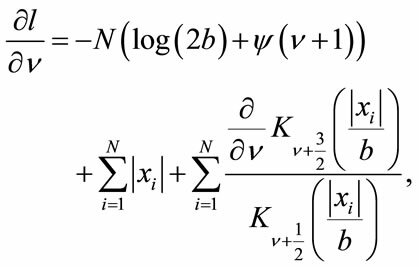 Different types of estimators for the K distribution have been proposed that try to overcome the high variance of the MoM and the difficulty in finding ML estimates. Iskander et al. in  propose the use of fractional moments which they show produce estimates with lower variance than the MoM. The authors in  and  propose the use of logarithmic estimators. ML estimates for a limited range of were presented by Raghavan in  based on an approximation of the K distribution using the Gamma distribution. Abraham and Lyons in  rely on the MoM with bootstrap to find a better estimator for the shape parameter. The same authors in  present an estimator of the shape parameter applied to sonar using a Bayesian adaptation of the MoM with analytical approximations using the gamma distribution (Bayes-MoM-AA), using the bootstrap techniques (BB) and a mixed one with their corresponding performances and trade offs. Other methods rely heavily on numerical methods to find the parameters estimates. They make use of iterative methods such as the Expectation-Maximization as in  and , 2-D maximizations as in , neural networks as in  and  or non-linear techniques, among others. These methods are robust albeit computationally expensive, which make real time applications infeasible. 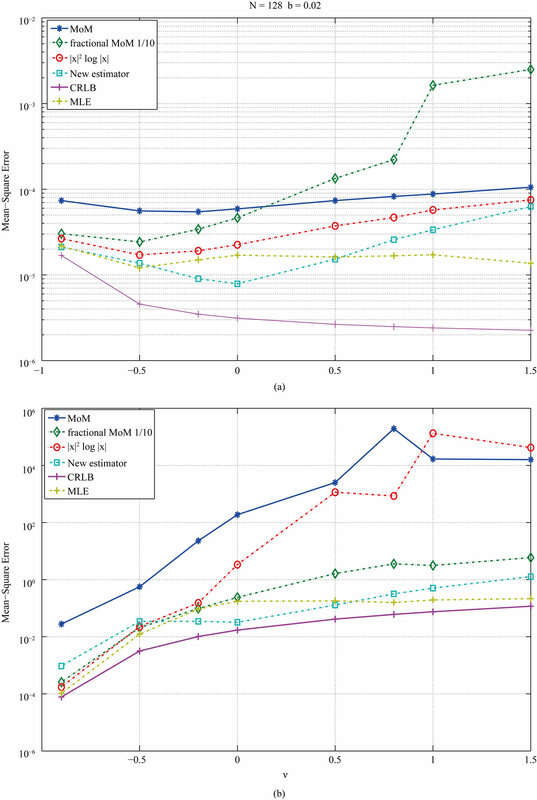 In this paper we derive an estimator that retains the simplicity of the method of moments with comparable computational requirements but has better performance when a small number of samples are available. The method is compared with other methods of the same complexity through simulations. The rest of the paper is organized as follows: In Section 2 we review some of the existing estimation methods. In Section 3, the derivation of the new estimation method is presented. Section 4 presents simulation results. Finally, Section 5 presents some conclusions. In this section we briefly review some of the estimators that have been proposed for the K distribution, which will be compared with our proposed method in a later section. Specifically, we proceed to find the estimators for the two parameters and b that define the doublesided distribution. The method of moments (MoM) computes the parameters of a distribution by finding expressions in terms of its moments. The moments are then replaced by their corresponding empirical ones computed from the sample set. respectively, where is the second empirical moment of the data and is the empirical kurtosis. The estimators are computationally inexpensive and easy to implement but they depend heavily on the number of samples available. A small sample set causes the variance of the estimator to increase to levels that make the estimation unreliable as it is seen on Figure 1. 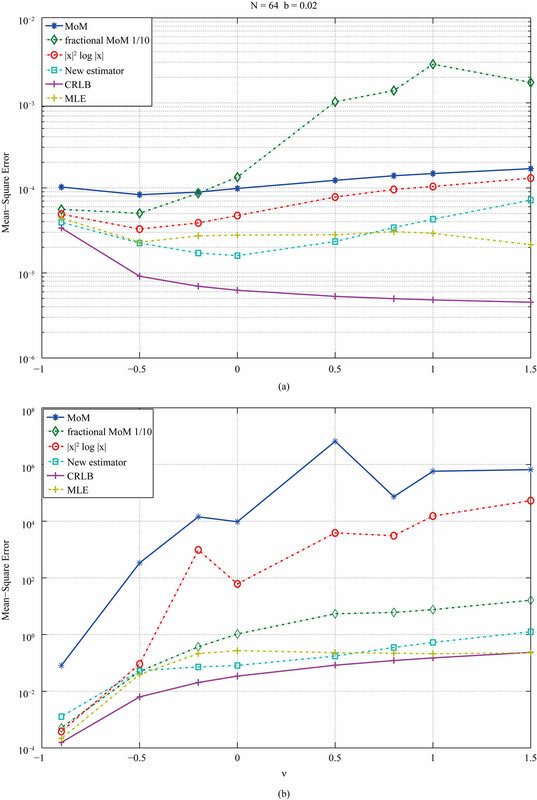 The figure shows MoM estimates and their variances for parameters and over 5000 independent trials as a function of the sample size. Figure 1. Parameter estimation (MoM) = 0.5, b = 0.02. The value of b can be estimated using the empirical second moment or any other moment since they establish a relation between b and . Blacknell and Tough in  proposed an estimator of based on which gives a comparable accuracy with the fractional moments estimators among others. They noticed that setting leads to simple expressions for the estimator of of the one-sided K distribution. We proceed with the derivation of the estimate that corresponds to the double-sided K distribution. This derivation follows the one given in , though in this case it is easily seen that setting gives an estimate that does not have as an argument of any , or any other exotic function. We also notice that the distribution is zero-mean and symmetric around the mean, therefore it makes sense to work with the absolute values since the logarithm of negatives values is not defined. The estimate is obtained by replacing the expected values by their corresponding empirical estimates. Maximum Likelihood (ML) estimation is one of the most reliable estimator even when only a limited number of samples exist. Also, the ML estimator is asymptotically unbiased and it attains the Cramer-Rao lower bound asymptotically better than any other unbiased estimator. 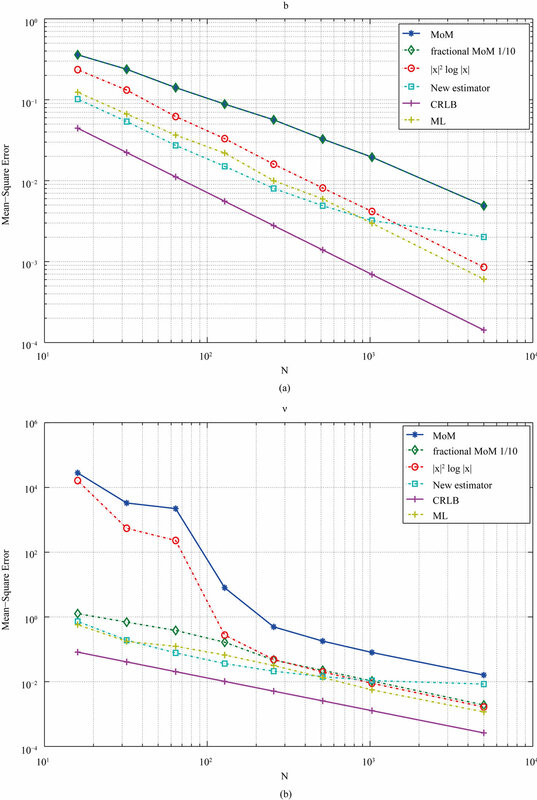 Though the ML estimator performs better than other methods, its high complexity prevents its use when limited computational capabilities are available. that finding closed-form solutions for both parameters is a difficult task. In fact, closed-form expressions cannot be directly obtained from them [7,9,10,15,17]. for the generalized Gamma distribution. 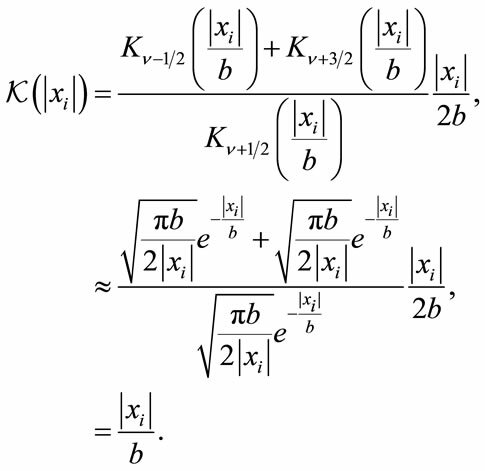 The maximum likelihood estimates can then be found using the expressions just presented and the equivalence in (3) for the double-sided K distribution. Although there exists a closed-form expression for one of the parameters, we are still required to use computationally intensive methods to find both parameters estimates. In  the maximum likelihood estimates are found using a cubic spline interpolation. In  the iterative method known as the Expectation-Maximization is employed. Finally in  and  neural networks are used. This has lead us to investigate a new estimate that retains the simplicity of the estimators previously presented which yields accurate estimates when we only have access to small sample sets of the process. 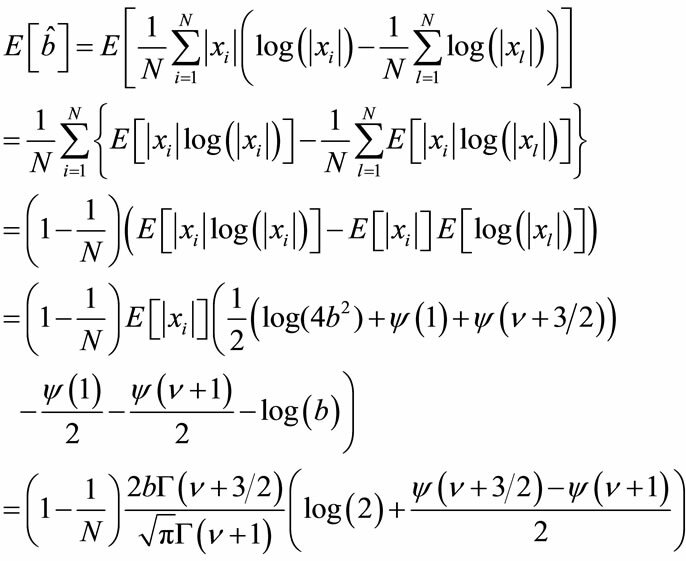 where is the log-likelihood function. Deriving a closed-form expression of the CRLB for the K distribution would be a daunting task but for specific parameters of the distribution. Kay and Hu in  have also proposed a method to compute the bound using the characteristic equation. For the purpose of comparing the different estimation methods we proceed to evaluate the CRLB numerically. 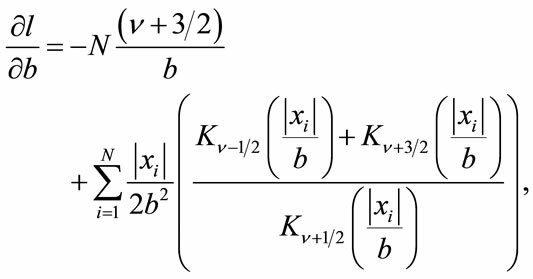 We propose an approximate method that leads us to a more tractable expression for the estimation of the K distribution parameters. This approximation turns out to have better performance than others for a low number of samples. Since standalone expressions derived from the previous equations are not known, using numerical methods as in  are the only methods to find the estimators. We notice that the presence of the modified Bessel function of the second kind, adds complexity to the derivation of estimators. Thus, it is more convenient to express in terms of well known functions since it eases the burden of finding the estimators. where the approximation corresponds to an equality regardless of its argument when . 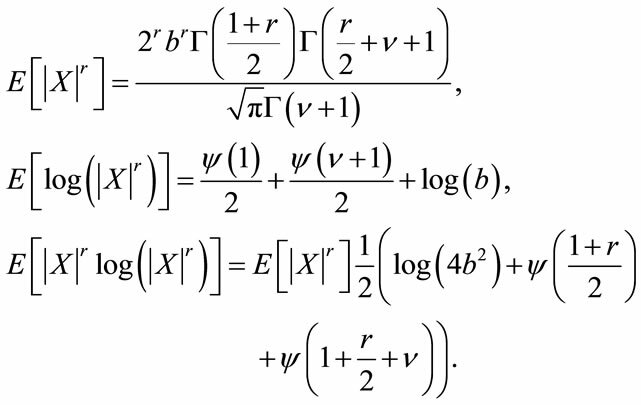 which holds since the log function is monotonic. The expression for just derived does not depend on , it is computationally inexpensive and it can be implemented using a fairly simple architecture. The estimators assume that the ’s values that are larger than b outnumber those that are not, because this ensures that the actual value of the K function is mostly dominated by the approximation (24). On the one hand, if b is infinitesimally small the condition is easily met since almost all are larger than it. On the other hand, if b is large, our estimators still perform well whenever N is small since only a fraction of the ’s would be smaller than b and the approximation holds. where it can be easily seen that only when . Therefore, the estimator just derived is not unbiased or asymptotically unbiased, except for . The accuracy of the estimator can be improved by subtracting the bias from the estimator. However, by doing so we end up with the same situation as before, even though without the modified Bessel function of the second kind. This is because the bias of b depends on the value of . Therefore, in order to find the estimates we will need an iterative process to find the values which increases the computational requirements of the estimators. In the next section the performance of this estimator and the ones described on the previous section are quantified. A series of Monte Carlo simulations were carried out to evaluate the performance of the estimators. The estimation methods were applied over 5000 realizations of a K distributed process and their performances were analyzed using as a measure the mean-square error. For compareson, a maximum likelihood was computed using a onedimensional search for the parameter with (17) substituting the corresponding value in (19). Also, the Cramer-Rao lower bound (CRLB) was evaluated numerically to compare it with the others estimators. We first analyze the performance of the estimators in terms of the number of samples available. The analyses are constrained to take on parameters with small values, and which does not limit its applicability since most of the known processes fall within those ranges. Figures 2 and 3 show some of the results for a K distributed random process with parameters , and , . Comparing with the other methods, our estimator outperforms them whenever N is small, for the cases shown here. We notice that when N is large, the performance of our estimator does not improve as the other methods do, being outperformed by them. This is not an unexpected result since our estimator is based on an approximation that does not guarantee the asymptotic unbiasedness of the estimator for all values of . We also notice that for small N our estimator performs similar to the maximum likelihood estimator with some values giving a slightly better performance due to the inaccuracies of the onedimensional search that depends on the choices of the grid spacing. Figure 2. MSE estimators comparison: = 0.5, b = 0.02. (a) Estimators of b; (b) Estimators of . Figure 3. MSE estimators comparison: = −0.2, b = 0.8. (a) Estimators of b; (b) Estimators of . Figure 4. MSE estimator comparison: N = 32, b = 0.02. (a) Estimators of b; (b) Estimators of . Figure 5. MSE estimator comparison: N = 64, b = 0.02. (a) Estimators of b; (b) Estimators of . Figure 6. MSE estimator comparison: N = 128, b = 0.02. (a) Estimators of b; (b) Estimators of . to the CRLB when N is small. 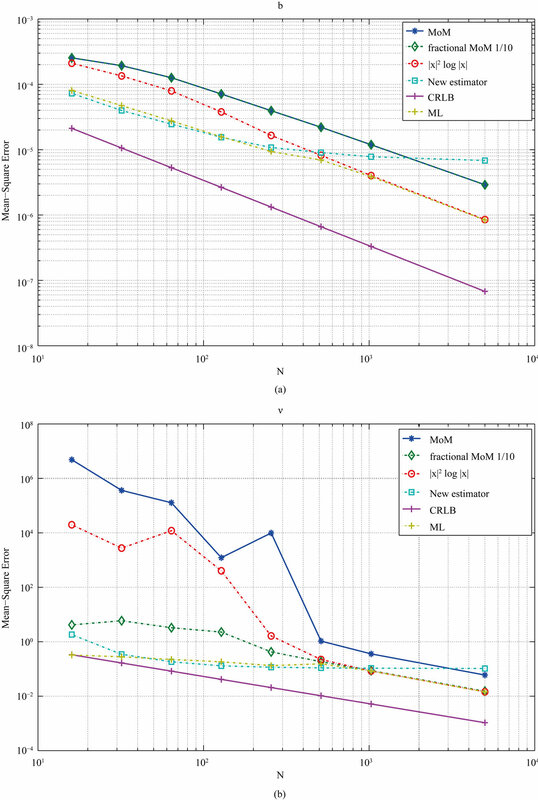 In general, the MLE is closer to the CRLB for all values of N.
The performance of the other estimators improves as the number of samples available for the estimation increases, as it is seen on Figure 7 for N = 256. Specially the outperforms the rest but for some values in which our estimators still outperform them. In , it was argued that the estimator based on comes as a natural limit of the fractional moments estimator of , this turns out to be true when the number of samples N is large, where how large N should be depends on the parameters and b, but not when N is small as it is shown in the figures. 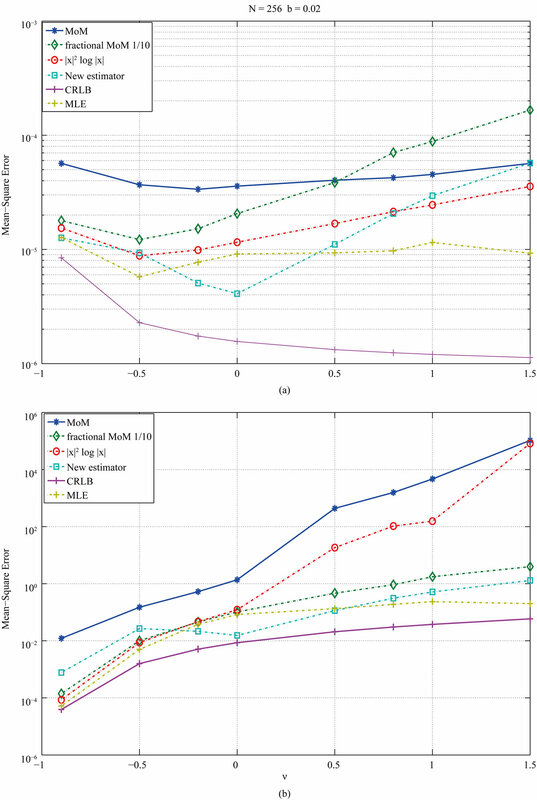 The results confirm that the proposed estimator outperforms other estimators that are comparable in terms of complexity and computational requirements. In this section we present an analysis of the computational complexities of the estimators presented in the previous sections. Specifically, we focus on the analysis for the estimators of the parameter referring to the expressions given in (6), (9), (12), (17), (18), (19), (27) and (28). end if end for where V is the set of all points that form the grid over which the one-dimensional search is done and is equal to (19). Let be the average number of iterations the algorithm needs to compute the estimate , then the number of operations is given by where is the number of operations per iteration. The value of depends on the grid size and its spacing. Limiting the range of values where to search would greatly reduce the grid size, otherwise, could be too large to be implemented on real time applications. 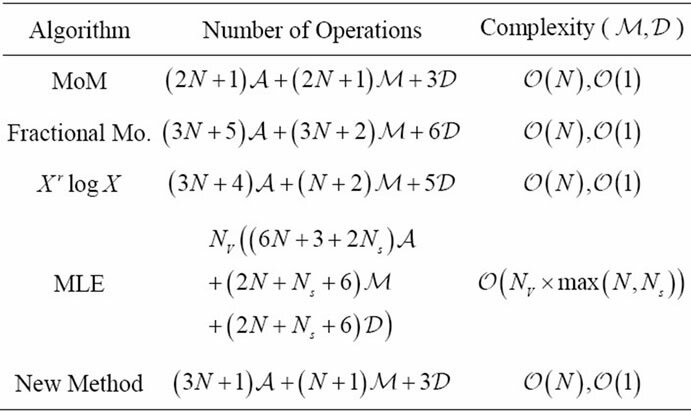 Table 1 summarizes the number of operations that each estimation method requires. 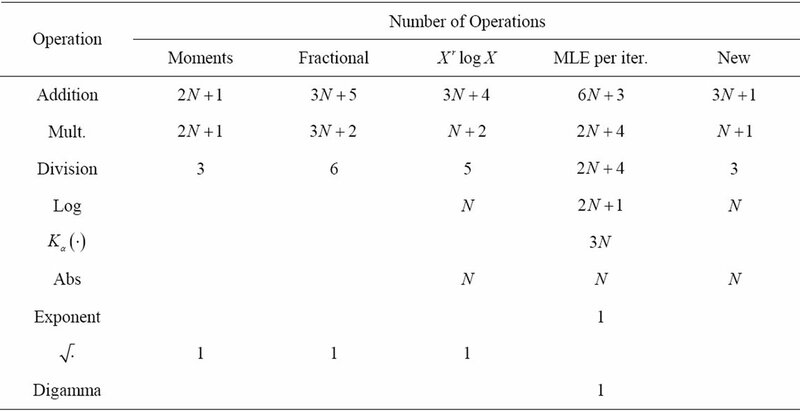 In the case of the MLE estimator the table shows the number of operations per iteration. 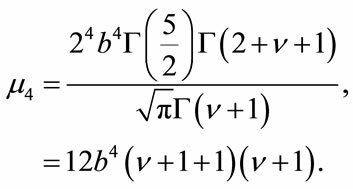 In the following analysis we ignore the complexity that the evaluation of the digamma function, exponential function and the square root requires since if they are evaluated in an estimator, they are only done once. In the case of the absolute value, the implementation only requires a check on the sign so overall in comparison with operations such as multiplications and additions its contribution to the computational complexity can be ignored. We also notice that any quantity raised to the second power is simply a multiplication with itself. Therefore the analysis reduces to the quantification of additions, multiplications, divisions, the evaluation of logarithm and the modified Bessel function of the second kind . The number of operations that contributes largely to the evaluation of using the truncated series is shown in Table 2. Now, we can quantify the complexity of the estimators in terms of basic operations such as additions , multiplications , divisions as it is summarize in Table 3. Figure 7. MSE estimator comparison: N = 256, b = 0.02. (a) Estimators of b; (b) Estimators of . Table 1. Number of operations of estimators. Table 2. Number of operations of a truncated modified Bessel function of the second kind. Table 3. Complexity of estimators. and for the new and other estimators is . 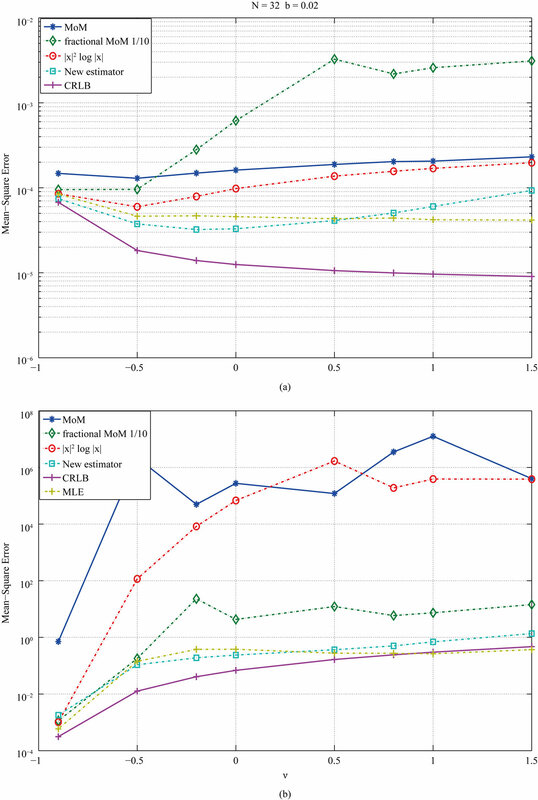 The new method has been proved to have a computational complexity that is comparable with estimators based on moments but low in comparison with the MLE. 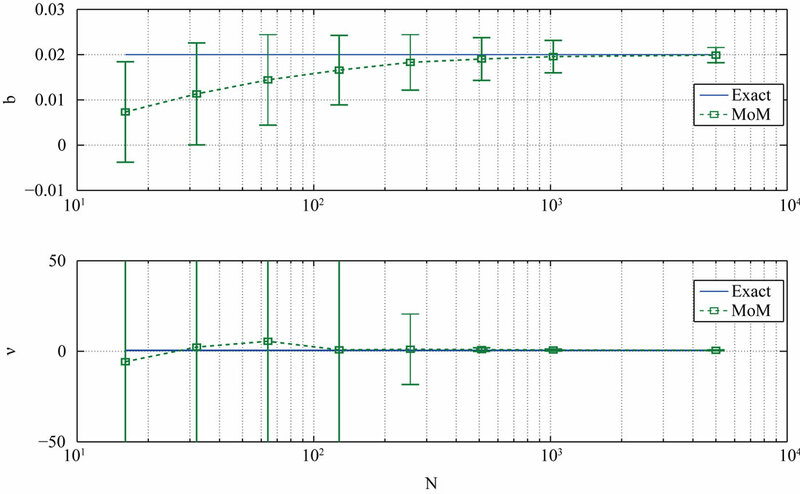 In this paper we have derived a new estimation method for the K distribution. The method provides an improved performance over existing techniques when only a limited number of samples is available. It has been shown through Monte Carlo simulations that the method produces estimates with smaller variance than others while maintaining their simplicity and computational requirements low. The performance of the proposed estimator is comparable to the maximum-likelihood without the complexity that this one requires. We would like to thank the Intel Corporation for funding this research work. D. R. Iskander and A. M. Zoubir, “Estimating the parameters of the K-distribution using the ML/MoM approach,” Proceedings of 1996 IEEE TENCON. Digital Signal Processing Applications, Perth, 26-29 November 1996, pp. 769-774. M. Abramowitz and I. A. Stegun, “Handbook of Mathematical Functions: with Formulas, Graphs, and Mathematical Tables,” In: M. Abramowitz and I. A. Stegun, Eds., Dover Books on Advanced Mathematics, Dover Publications, New York, 1965.